United States Flour Market Analysis Report: Industry Overview ( Demands, Size, Trends, Share, Challenges & Growth Opportunity), Forecast 2017-2025. Flour is made from various types of grains, and is used in various applications from food manufacturers to bakery to wholesalers. Among the various brands selling flour in United States, the most preferred brand is Gold Medal, with 148.48 million people using Gold Medal flour. The U.S. agricultural market is organized and thus it accounts for strict quality check of the flour produced in entire region. The flour is used for multiple purposes and the technology to process it is continuously developing in terms of the gluten and other nutrients presence and thus, it is further driving the growth of the U.S. flour market. Moreover, the personal disposable income, demand for organic flour and growing food industry are further inducing the growth of the market. Though U.S. accounted for only 8% share in global wheat production over the past decade, but U.S. is one of the top exporters of wheat, leading to larger wheat and wheat flour production. Further, the trend of using GM crops has reduced the gluten content in the flour produced, thus making it challenging for the bakery and food processing industries in using flour and therefore, it requires more expenditure on buying gum to make the gluten flour usable. Goldstein Research analyst forecast that the United States flour market is set to reach USD 16 billion by 2025, growing at a CAGR of 1.1% over the forecast period (2017-2025). Wheat flour accounted for the largest market share of 44.7% in 2017 of United States flour market. Wheat is the major staple crop in U.S. and also it is most easily produced flour type as compared to other flour type. Geographically, Kansas State accounts for largest production of flour making grains such as wheat and rice. Therefore, Kansas State accounted for the largest market share of 61.2% in 2017 of United States flour market. The report covers the present ground scenario and the future growth prospects of the flour market for 2017-2025 along with the market players’ analysis. We calculated the market size and revenue share on the basis of revenue generated from major players in the United States region. United States flour market is forecasted on the basis of flour production supply and agricultural produce. United States flour Market Outlook 2017-2025, has been prepared based on an in-depth market analysis from industry experts. 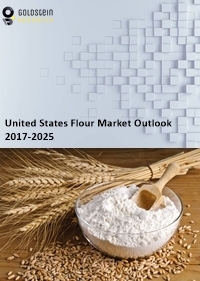 The report covers the competitive landscape and current position of major players in the United States flour market space. The report also includes porter’s five force model, SWOT analysis, company profiling, business strategies of market players and their business models. “United States Flour Market Report” also recognizes value chain analysis to understand the cost differentiation, pricing models to provide competitive advantage to the existing and new entry players. Our United States flour market report comprises of the following companies as the key players: The Pillsbury Company, Grain Millers, C. H. Guenther & Son, Shawnee Milling Company, Siemer Milling Company, Blendex Company, Chelsea Milling Company, Star of The West Milling Company, Post Foods, Bay State Milling Company, Bob's Red Mill Natural Foods, Hodgson Mill, Italgrani U.S.A., Giusto's Specialty Foods, The Mennel Milling Company.